Couldn’t make it to one of our in-house GPS classes? No worries! now you can join Touratech Adventure Expert and Touratech Rally Ride Coordinator, Eric Archambault for this in-depth, GPS skills class. This class will focus on using tracks as a navigation tool. It will cover what tracks are, and why they are used for backcountry navigation. The process of loading and displaying of tracks will be covered, as well as our recommended display settings. It is recommended that you follow along with your GPS, but is not required. Need a GPS Unit? Click Here! All right, Navigating With Tracks Tips & Tricks, and this is gonna be the second part. We already covered in the first video what tracks are, some basic terminology, how to get tracks from the internet or an email to your computer, to Garmin BaseCamp, and into your GPS. Now we’re gonna talk about how to set up your GPS to best suit following tracks. I like to call this section Optimizing Your Display. That’s what you’re gonna be looking at when you’re out there in the woods and you’re chasing these tracks, and you’re doing a backend discovery route, or the Touratech rally, or something like that. The things that we’re gonna talk about too, they’re all on the GPS side of it, and we’re focusing on the Garmin units just because, as I mentioned before, Garmin has the biggest footprint for this type of use in GPS. But if you’re using a cell phone app, or maybe a Trail Tech or something like that, the things that we’re adjusting you should be able to adjust on any of those. These are fundamental settings that, if your unit doesn’t give you these options, you should probably find a better unit unless it’s defaulting the right ones. But I’ve yet to come across any of them that don’t give you all these options. The first one’s gonna be map view. You’re gonna spend the most of your time looking at the map, and you have three different views generally speaking. The first one, we’re gonna start at the bottom right, and this is the automotive view or the 3D view, depending on the unit the terminology can change. And this is what a lot of your automotive GPS units, a lot of the cell phone apps, and even a lot of the GPS’s default to. It’s because it’s really easy, it’s that video game view, you have that 3D fake horizon, stuff further away is smaller, and it’s comfortable. But the problem is you don’t have real scale, it’s not like looking at an actual map where an inch close to you and an inch far away from you are the same thing. It’s great if you’re just doing turn-by-turn instructions, if you say, “Just take me to this address,” it works well for that. I still use it a lot of the time, if I’m leaving Seattle and I say, “Take me to [inaudible 00:02:15],” and I’m in the van, a lot of times I’ll use this view. A lot of times this view will have some auto-zoom, so if you’re doing 70 down the highway it zooms out, when you come up on an exit and you’re slowing down it zooms in. But a lot of times it’s harder to turn off that auto-zoom, if you can even do that. And if you’re following with track, being so far back in the screen, if you miss a turn the whole track disappears, where the top-down views you’re centered up. So it has its place, it’s easy to use, and it’s great, I think, for just doing turn-by-turn navigation. Like I said, I use this still a lot of the time, if I’m … Especially in the car … and I’m just typing in an address and “take me there”. But it is not ideal for riding tracks or following tracks and doing backcountry type navigation. The next one, if we move over to the lefthand side, is gonna be track-up. And a lot of times when people go, “You know, north-up just didn’t give me enough information, I want some more, I want a real scale,” they’ll go over and do track-up because up is always forward. It’s easy, it’s nice, you do get the real scale, you get … You’re a little bit forward on the screen so you see a little bit more behind you. But the problem with track-up is you have to look at that little cardinal arrow in the corner, again, to see where north is. And it’s real easy to get turned around and lose track of what direction you’re going, you can leave camp, you do a couple S-turns, and suddenly say, “What direction’s camp,” and you say, “Just down that road I just came down,” well what direction is that? What direction are you looking right now? You don’t know. So it gives you a lot more information than the 3C or the automotive view, but it’s still in my opinion kinda bush league, and with all of us here at Touratech we’re gonna be running the north up, and you start getting lost and you’re running track-up, we’re probably gonna bust your chops a little bit for maybe not running the best mode that you can. Top-center, and the reason why I put it top-center, is north-up. You’ll see, there is no cardinal arrow where north is because north is up. In this case, I’m facing south, and that is the hardest thing when you’re doing a north-up display, is you might be going south. If you’re going south and the screen shows you’re going left, you’re gonna be making a right turn to do that. The way that I’ve found to get around this, and it even makes you more situationally aware, is, besides the fact that if you’re heading down you know you’re going south, you also start thinking, instead of thinking up, down, left, right, which are completely arbitrary or just based on your path of travel, and your map’s spinning around you, your map’s gonna be fixed. You’re heading south and you see a line going to the left, you’re going, “I’m heading south, I need to go west.” If you start thinking in those cardinal directions, making those turns is a lot easier, and then if you’re slowly meandering in a circle you’ll notice that, “You know, I was going north, and then I started going east, and then I started going south, and now I’m going west, and then I started going north again, did I just do a big circle?” You’re a lot more aware of the big picture. The other advantage, especially if you’re not just chasing a track, maybe you’re navigating with track but you’re trying to get somewhere, or you’re using that in reference with a map, when you grab a map, nobody picks up a map and holds it upside down. You hold it with north up, that’s the way every map is designed. And if you have a north-up display, you can hold up the map and it’s gonna line up pretty easily somewhere on there. You gotta figure out where you are on the map, but then when you look at it everything’s gonna line up. So north-up is the way that I recommend navigating with tracks. There’s a little bit of a learning curve, especially when you’re heading south, but you’re gonna have a much better picture of where you’re going, not just, “I’m following the line,” but you stop and you’ve been following the track and you stop, and someone covers your GPS and says, “What direction were you heading?” You’re gonna know roughly, you might say east and you’re heading south-east, or something like that. Those are the three views. They all have their place, but north-up, if you’re navigating tracks, is the one that I recommend, that’s the one all of us at Touratech run, and anybody that spends a lot of time in the backcountry that I’ve come across runs north-up because you just have much better awareness of where you are. You have the three options, experiment with them, but north-up, I would put in that little bit of extra effort and get comfortable with it and use it especially for backcountry navigation. Next thing we’re gonna have is track color, and when you’re selecting the track, we’ll show this on the unit-specific videos for how to show a track on your GPS, you have the option of selecting your color. We have a couple of different examples here. We got the yellow down at the bottom right, we got a purple over on the bottom left, we got a white top-right which is extremely hard to see even on the topo map, and then the red in the top lefthand side. Some of this … The track color that’s gonna be ideal for you will depend on your maps. There are some colors that, if you’re running city navigator, are gonna pop a lot more than they do on topo. White I don’t think’s gonna work well at all unless you’re on the water, and then I think it’s gonna work really great if you’re doing boating stuff and you just have that white line on the blue, I think that would probably contrast nicely. But you can see on the topo maps, even not bouncing around on the road and probably on a bigger display than what your GPS is, it’s kinda hard to see. A lot of times if the main one I’m using red, the alternate maybe I’ll use yellow or purple or orange, so when I come to that intersection I can make that decision, do I wanna follow that, or, “Okay, I know I’m gonna take the alternate route, so when I see the purple I’m gonna take that turn.” It’s good to know that the colors are changeable, you wanna find contrast. On the older Zumo units, the 660, the Zumo 665, the BMW Nav IV, regardless of what color they were in the computer, they were always gonna show up as black on your GPS unit by default, and it’s a weird thing that Garmin did. You’re gonna probably wanna go back and change them because black, there’s a lot of black on your GPS display already, it’s not gonna contrast well and you’re gonna have a hard time following it. Another thing to keep in mind, if you’re at the Touratech rally, we use a modified skiing system, so the easy tracks are gonna be green, the intermediates are blue, and then the hards are red. Green is hard to follow on a lot of the … Especially with the topo maps you’re gonna wanna change that. We do it that way so, when you’re selecting your track and it pops up initially, you’ll see that if you’re a beginner rider with street tires and you’re selecting something and it pops up red, it’s kinda danger, and maybe that’s not the one you wanna do. And it just makes it a little bit easier when you’re selecting the tracks. But it is selectable on the GPS unit itself, and just make sure it contrasts well so you can follow it. A lot of the time when you’re standing up offroad you’re just taking quick glances at it, so you really want it to pop like that red or that purple does. The next one is gonna be maps. In North America there’s gonna be pretty much … Or the United States at least … There’s gonna be pretty much three maps that you’re gonna use. There’s City Navigator, which is what all the Zumo units are gonna come with, and I generally recommend running a unit if you a Montana, or at least having it on there for some applications. Then there’s gonna be 24k topo and 100k topo. In other countries the scale of the topo maps are gonna vary just because if they’re using the metric system they’re not using … They’re gonna use whatever the standard for the paper maps is. In the United States, 24k topo is one foot equals 24,000 feet, and the 100k topo is one foot equals 100,000 feet. So if you translate that back over to a USGS map, an area map would be 100k topo, and then a quadrant map, which is gonna be finer details, is the 24k topo. When it comes to the GPS maps themselves, the big difference is the 100k topo is not routable. So it’s gonna show roads and show all that, but you can’t type in an address, it doesn’t know what addresses are because, to make the file size smaller, it’s just really an overlay. Where the 24k topo, it knows what roads are, so you can put in an address and it will take you there because roads are roads, it’s not just an image, it’s not just an overlay. For motorcycle use, when it comes to the topo side of things, I recommend the 100k topo. And a lot of it is … The 24k topo is nice if you are hiking and stuff, because it’s gonna show a higher level of detail, and a lot of times it will have hiking trails as hiking trails, so if you’re using a Garmin Montana or a backpacking GPS and you’re hiking, and you say, “I wanna go to a certain location,” it will snap you to hiking trails, or it will route you down those things. For motorcycle use, you end up with a lot more detail to the point that, when I’ve used a 24k topo before I’ve actually turned down the detail level, and we’ll discuss the detail level shortly. But it’s just too much information, you’re traveling a lot faster on a motorcycle, and if your topo lines are a little less detailed it’s not gonna matter. So I recommend on the topo side of things using the 100k topo. And then City Navigator’s always great to have. These two screenshots that we’re looking at, the one on the righthand side is 100k topo, the one on the lefthand side is City Navigator, and this is just a chunk of highway 410 in Washington state. You can see that having the topo lines a lot of times, if there’s not a lot of roads, it’s gonna show you a lot more. Even though the topo is showing a little bit higher degree of roads, having all those contour lines is gonna give you a lot of information, especially if you understand how to read them. And a lot of times if you’re riding a backcountry discovery route and you’re in the middle of the woods, you’re not gonna have a lot of road, so seeing a ridgeline and then looking at that in the real world and seeing it follow along, you can see the road maybe is halfway up that ridgeline and is tracing it. You can look at the topography itself and go, “We’re going that way and we’re probably gonna hook up ahead.” Where, just having a road, you don’t really have any reference points. The City Navigator map set, and it’s kind of a misnomer because City Navigator from Garmin does show pretty much every road. It’s very rare that I’ve been on a dirt road that it doesn’t show. Most of the time if the road isn’t shown there’s still the grader that made that road parked on that road if I’m up in the woods. It does show a lot of it, you can totally navigate a backcountry discovery route using City Navigator, it’s gonna have, odds are, every dirt road that you’re on. The other nice thing with City Navigator software, and the reason why I recommend everybody has that just in their unit even if they’re not using it, is it’s gonna have all sorts of points of interest. It’s gonna have gas stations and restaurants and hospitals, and if you have City Navigator enabled and somebody gets hurt out in the woods, you can go, “Where’s the nearest hospital?” And it’ll give you turn-by-turn instructions, it’ll say turn left, turn right. Even if you’re on the dirt roads, to get you down to the highway, you can get out to the hospital where you can get somebody some help. Another important thing, when it comes to the maps, the way the Garmin hierarchy of maps works is City Navigator always knows more than 100k topos. You can be somewhere where there’s maybe not a road on your screen, you started overlanding out in the desert, there’s nothing on your screen, you just have a black screen, and you have both 100k topo enabled and City Navigator enabled, and you’re gonna see nothing. As soon as you go into your map settings and you disable City Navigator so your only map is 100k topo, you’re gonna get all the topo lines, and if there’s any other map data that it has it’s gonna show it. It’s an important thing to remember that, just because you have both maps enabled, you might not have the most useful map because the way Garmin stacks the usefulness of maps is City Navigator trumps topo maps. It might not be showing you anything useful, but since you have it enabled it assumes that it is the better map. This is where, on all the current series Zumo units, the 395, 396, the 595, 596, Nav V, Nav VI BMW units, you have different ride modes. It’ll give you onroad, offroad, motorcycle, and you can … The changes you make to your maps will only live in each one of those things. On the outdoor units like the Montana and the Oregon, the 60 series, you have different profiles, and you can have these things … Different setups in each one. So instead of having to go in and change your map each time you’re doing a different thing, on the current generation of Zumo and BMW Nav units there’s a little icon on the top with either a car or a bike or a dirt bike wheel, and you select that and switch between it with a push of a button. With the Montana and the other ones you can, the outdoor units, you can quickly change profiles. So you can download a new unit for your application. And the big thing is just make sure you’re using the right map. Even though you can do a backcountry discovery route with City Navigator, generally I’ll have City Navigator and a 100k topo both installed in my unit, and when I get down and start getting on the dirt I’ll switch over to topo because having the contour lines is so often more useful to me than having a black screen with one road. I’ll still have that one road, I’ll still see my track, but seeing the contour of the land, it’s really easy to see the curves in the map and then relate it to what you’re seeing in the real world and gleaning what’s happening a mile or two miles or half a mile or 20 miles away. So use the best map you can for your application, but just remember, if you have City Navigator and topo both enabled you’re probably not gonna see the topo until you disable City Navigator. And that’s why having the different ride modes or different profiles is nice because you can have your setting for when you’re offroad and you’re setting when you’re onroad, instead of having to make changes in menus you can just do a broad change and go, “I’m now offroad, I’m in my offroad mode,” which is always gonna be north-up and topo maps or something like that. Next one is map detail, and the two pictures here in some ways are a bad representation and some ways a great representation. The one on the left is normal detail level, and the one on the right is high detail. Depending on your unit, you have three to five different detail levels, and on the outdoor units like the Montana you can fine tune it where you can have your detail level for topographic things, your points of interest or road names or roads. On the Zumos you kinda just have one volume knob, so if you think of it as stereo, on the Zumos you just have volume, on the outdoor units like the Montana you have a full deck of knobs where you can adjust depending on what it is, you have a full equalizer. Generally speaking, with the current units, I normally leave it on normal, and here you can see it went to high detail and didn’t make a difference. The only time I’ve really used this has been if I’m running City Navigator and I’m kind of out in the middle of nowhere, I’m out in the woods, and if you go to higher detail sometimes you’ll see the little side roads sooner at a further out zoom level so you can get a bigger picture. I’ve also used it if I’m running a 24k topo when I’m in, especially on the east coast, a forest, and there’s just a ton of parking areas and hiking trails and stuff, and the screen can get overwhelmed with information that you’re just caring about the roads and some topo lines maybe, and you just have so much information that you gotta dial it back. But generally speaking, the normal level is fine in a large degree, and I think where the Zumo series units have gotten away from the adjustability on it. This is a carryover from the processors that were a lot slower, where if you went high detail they got really choppy, and 10 years ago, those units, if you went super high detail and you were traveling at speed they were not very smooth. These days I’d say generally I leave it at normal. If you crank it up to high because you want more detail, you probably won’t see much of a difference. The big thing is to know it exists, so if you find your screen really cluttered with too much information you can go into your settings and you can turn it down. Or, if you’re out in the middle of nowhere and you just don’t have any information you can try turning it up, and chances are maybe you’ll see some spur roads a little bit sooner. Not one that you really need to mess with. Eight, 10 years ago it was something that you ended up using more just depending on how much information you had and trying to keep the GPS running smoothly. But it’s something that you should know exists but you’re probably not gonna need to adjust. The next one is gonna be icon or vehicle, and again that one kinda depends on the unit itself. When you’re in 3D mode or automotive mode, all the icons seem to work really well because it’s kinda prominent, front and center, and they look really cool. I know from Garmin you can download Star Wars ones and Simpsons ones, they’ve done all sorts of things with different TV shows and movies. But it really comes down to you needing something that’s gonna show up well. On the bottom lefthand corner we have the dirt bike that a lot of people will use because it sounds cool, I think the official name is Dirt Digger. But when you look at it from a top-down view, that’s really kinda hard to see, and it’s kinda hard to see which direction it’s heading. Like I said, 3D mode, you’re always going up, it’s front and center, it looks cool. But it doesn’t really work too well in a top-down view. We go to the bottom right and we got the pickup, and that’s kinda the same thing, it kinda blends in a little bit, it doesn’t really pop. We go up top, we’ve got the crow, that one’s a little bit better, it has a nice highlight around it, kind of a cheeky thing on “the way the crow flies”. And then the top left is the one I use most of the time, that’s the 3D arrow. It’s old, it’s from the 80s, it looks like a terrible 80s video game, but it’s really easy to see what direction it’s pointing and what direction it’s going. There’s a whole bunch of preset ones, and as I said you can download more, I think at some point you can even customize them. But pick something that’s gonna show up well. And since you know … If I’m on my Montana I do have an automotive profile, and a lot of times I do use the truck in that one, and some of it is when I turn on the unit, if I haven’t used it in a little while and I’m wondering why I’m in 3D mode and everything is wrong, it’s a reminder that okay, this is my car profile, this is the one I use in the truck. It can be useful there if you have a profile you’re always using in 3D mode, you have a different one that gives you that visual cue. But generally for navigating with tracks I use the 3D arrow because it is the easiest to see. It works really, really well, there’s a reason why they came up with it and they haven’t really changed it. It’s boring, but there you have it. If you wanna mess with your buddies, there is normally on the Zumo units a pink scooter, and you go into settings and you change it. They’ll learn real quick how to fix that, I’ve seen that. There’s a lot of them, but 3D arrow is my go-to for navigating with tracks, and if you’re having a hard time following your little dirt bike, try that one, it’s gonna get a lot easier. Now we have zoom level. We have four different zoom levels here, this is all Montana screen grabs from the exact same location. We have 300-foot, 500-foot, 800-foot, and 2/10 of a mile scale. And in the bottom righthand corner of each screen you can see the little scale thing. If you’re out there in the woods, you can kinda lay your finger on top of it and then measure out distance if you need to. These are the four scales that I generally use, and a lot of it is gonna be dependent on your speed that you’re traveling. So 300-foot scale, if I’m riding single track, that’s probably … I might be zoomed into that. You’re gonna have a lot more detail, you’re going a lot slower, you can’t see as far, but you’re gonna have more detail. The 500-foot and the 800-foot scale, a lot of times if I’m running the Touratech rally, doing the rides or backcountry discovery routes, a lot of times the scale I’m gonna be in. It’s a nice balance between seeing some distance and still having the detail, where with these touchscreen GPS’s it’s hard to hit the zoom button without missing, and then not actually zooming it and dragging your screen, or going to a menu, or something like that. I’ve gotten in the habit with the Garmin Montana, and any of the touchscreen GPS’s I use, to kinda find the scale that is gonna work, and then if I’ve just got off the highway and I know I’m gonna do some really tight stuff, maybe I’ll zoom in a little bit or zoom out one, something like that. But generally I’m not making on-the-fly zoom changes. At first, it was a little bit weird, but you get used to it, and the 500-800 foot scale works really well for that because the GPS’s, be default, you’re still gonna see a lot of the spur roads, you’re gonna see a lot of the detail, and you can still see further enough down the road, especially with the speeds you’re traveling offroad, and even general back roads and things like that. 2/10 of a mile scale I’ve started to use more, and some of it just depends on what you’re doing, how fast you’re going, and then the quality of your tracks as well. In 2018, KTM did their ultimate race qualifier, and they were trying to simulate a more road book conditions using GPS’s. 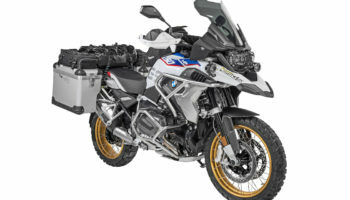 So a 200-mile GPS track had maybe a couple hundred points on it, so the line a lot of times went off the road, and it wasn’t like following a Touratech rally track or a BDR track where it was super accurate. They were intentionally very inaccurate to make you have to look miles ahead and make sure you’re going where you’re going. That’s when I spent a lot of time at 2/10 of a mile because I needed to see a mile down the road which direction I was heading. When I came up at an intersection and it looked like I was going left, and I actually needed to go right, I could make that decision, where if I was zoomed in at 300-foot I wouldn’t have that information. If you’re going fast and maybe you do more road type stuff, it’s nice getting to see further ahead, or if you’re using really low quality tracks that aren’t following the roads and the paths very well, it’s good because it gives you a bigger picture. But it can be a little bit harder to navigate. And with any of these zoom levels, one of the things you do have to keep in mind is your icon. You are at the middle of your icon. Especially when you’re zoomed out further, if you’re at 2/10 of a mile and your icon is almost half that size, your icon is 1/10 of a mile big, it’s at the middle of that.